The George Hotel, developed by Midway and Valencia Group, is nearing completion in College Station, Texas. 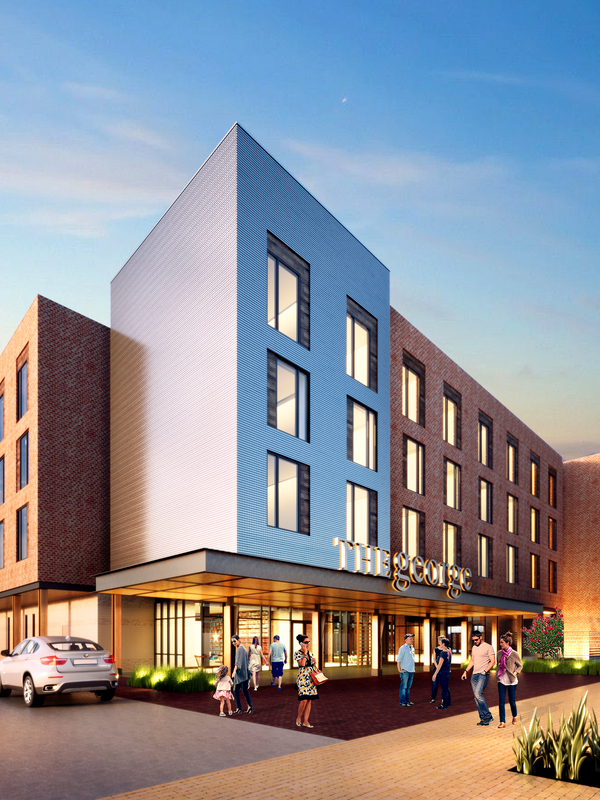 COLLEGE STATION, Texas – The George, a 162-room hotel developed by Midway and Valencia Group, will open in August near the Texas A&M University campus. The hotel’s name is taken from notable “Georges” such as President George H.W. Bush and George Mitchell, the developer of The Woodlands. The hotel is part of Midway’s Century Square, a 60-acre destination by Midway offering retail, dining and entertainment venues; office space; apartment homes; is creating a walkable, urban landscape authentic to the Brazos Valley. The hotel’s VIP suite offers balcony views of Texas A&M University, Kyle Field, and the Bonfire Memorial. The George is located adjacent to retro-military inspired Cavalry Court hotel, which opened last autumn. Both are Midway and Valencia Group projects located within Century Square. Century Square is a public-private collaboration between Midway and The Texas A&M University System utilizing previously undeveloped land to deliver substantial benefits and an enriched quality of life for local residents and the region. Phase one of Century Square is anticipated to be complete in Fall 2017. Introductory rates at The George start at $134 a night. Midway and Valencia are also developing Hotel Alessandra in the GreenStreet development in downtown Houston.